Color: Black Mesh fabric with Blue Solid fabric wall on one side Size: Size - 200 x 200 x 200 Cms Ht. Weight - 6 Kg. Material: Fabric : 170T, 300 Mm Polyester Mesh :B3, Side Wall - Polyester Solid Fabric, Frame : Highly Retractible Flat Steel Wire Frame Folded to a small ring shape. 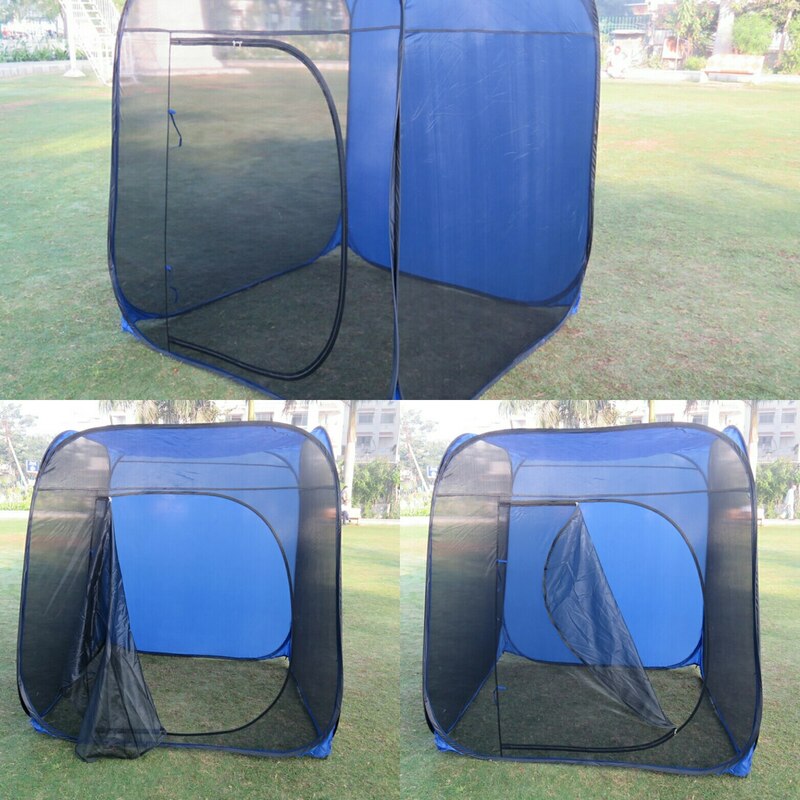 Supplied with a carry bag for easy portability Provides great air ventilation with clear surrounding view Key features: Made of high quality polyester mesh fabric. One side wall covered with solid polyester fabric. One side provided with large zipper entry gate. Provided with zipper round carry bag. Can be folded and unfolded in seconds. Protects from mosquito and flying insect bites. Facilitates to see the spectacular view of surrounding. Permits natural air breeze to pass through. Easy to carry while travelling. Gross weight: 4 Kg. Materials used : Fabric : 170T,300 mm polyester mesh :b3. Side wall - polyester solid fabric. Frame : Highly retractable flat steel wire frame. Applications: Most suitable to use in garden restaurants,ice cream and food parlors,terrace conference,farm house,sea beaches,swimming pool side etc.specifications: Dimensions : - 6' x 6' x 6' ht. SPECIAL INSTRUCTIONS : Return of this product is not accepted by the seller unless it is found defective by the buyer while taking delivery and/or if the product is not as per its description on website. Such discrepancy is to be reported along with proof of the same within 24 Hrs. after delivery of the product .